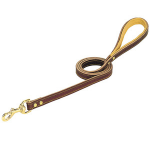 Braided Leather Leash 4ft | Florida Farm & Feed, Inc. Precise color-matched stitching adds the finishing touch to this beautiful leash that also features a heavy-duty, no-rust solid brass swivel clip and brass-plated rivets. This collar is ¾-inch wide and is available in 4-foot and 6-foot lengths to fit most dogs.